The JM26 electric motorized table top laminator is engineered by Drytac to deliver a combination of performance and value unequalled in the finishing industry. This laminator is ideal for permanently mounting onto cardstock, foam board, MDF or rigid PVC board. The JM26 is a solid mid-sized laminator that delivers superior results for beginners and experienced users alike. Easy to set up and operate, the JM26 is widely used by photography studios, picture framers, digital art studios and other creative shops. This machine offers a variable speed electronic drive, all steel construction, forward and reverse functions, photo-electric safety stop, foot pedal control, supply shaft and silicone rollers. Okay, now the machine has been unpacked. We actually set it on the table we intend to use the machine on. We'll describe some of the features towards the back of the machine and what the machine is actually supplied with. The machine comes with a main UK power lead for the UK market and also a Euro plug for the European market. Also on? towards the back of the machine, you'll notice here the actual plug point for the plug, which we will now do. You'll actually notice as well that there is a foot control pedal on the machine, which is already plugged in. So, we'll now plug the English plug into the back socket and you have the main power on/off switch next to the plug socket as well. Also on the back of the machine, you'll notice that this is what we call the out-feed table. This has to be kept clear. The bench has to be kept clear behind the machine so that when the work is feeding through the machine, it has an exit area. Onto the front of the machine. You'll notice that we have the power now on with the power indicator light illuminated green. On the other control panels, what we have here: you have an auto and a foot control switch. The auto is when the machine is powered and continuously moves forward. When it's in either of the directions, the foot control is when you are actually using it via the foot switch. You also have the rocker switch, which is off, forward and reverse. Obvious: forward to go forward; reverse to go backwards. Also, the machine has a speed adjustor so that you can actually increase the speed of the rollers. Onto the other aspects of the machine. We have the height adjustments; which we'll demonstrate on how to set the height of the rollers. I'd like to talk to you about the Magic Eyes and the safety features of the machine. You'll notice with the rollers running, we've got it set into Auto Mode, we're not using the foot pedal at all. When I break the Magic Eye, the rollers actually stop and the machine beeps at you. When I take my finger away, the beeping stops and the rollers will start turning again. If you put it into foot mode, I'll put my foot on the foot pedal. Again, when I break the Magic Eye, it will make an audible noise or beep at us, but the rollers will keep on turning. One of the things with the control panel is when you have the machine in automatic mode, it will only work with forward. When you have it in reverse, the machine will not operate. You have to put it onto foot control and then press the foot pedal control down to actually make the machine go backwards. You have, at the front of the machine you'll notice this is a dispenser bar for when we are using Self Applying MagnaFilm. To attach the dispenser bar to the back of the machine, they'll just slot into the location. Please note that the core darts are facing it towards the back of the machine; rolling towards the back of the machine and we'll come on to show you how that is used later on. Onto the front of the machine; onto the in-feed table. You have to again keep this clear for any work that you have going in and also, as I said earlier, on the exit of the machine You'll notice also on the in-feed table there is a calibration guide that will help us make sure that everything is square going through the rollers. You'll notice, also the other thing with the machine, is that the actual rollers will open up to a maximum gap of 15 millimeters; so I think you can mount onto anything up to 15 millithick. The final thing to do once the machine is fully set up and your happy that everything is working is to fill in the warranty card that is supplied with the machine and return it to the address on the back. Transcript: Okay, when it comes to using the machine, the first thing that we are going to show you is how to mount a picture down to a board. While we can use various substrates including card, M Dear, Foam Centred Board, up to a maximum of 15 millimetres thick. Once you've chosen the substrate you which to use, we need to set the height of the rollers. One thing that you have to be aware of; always make sure that the rollers are kept open when not in use to avoid any damage to the rollers. Okay, when it comes to using the machine, the first thing that we are going to show you is how to mount a picture down to a board. While we can use various substrates including card, M Dear, Foam Centred Board, up to a maximum of 15 millimetres thick. Once you've chosen the substrate you which to use, we need to set the height of the rollers. One thing that you have to be aware of; always make sure that the rollers are kept open when not in use to avoid any damage to the rollers. To set the height of the rollers, take your chosen substrate; insert it between the rollers in the centre of the machine. At the same time take a hold of both handles. Turn them clockwise downwards until the actual top roller hits the substrate. They go slightly loose. When they hit the bite point again; to maintain pressure, it's an extra half a turn on both wheels. Once you set the height of the rollers to the thickness of the substrate, as a double check, introduce the board parallel to the rollers and then using the calibration guide, on the front of the machine, check that it is running through parallel. So, we'll just send the board through, making sure that it stays in line with the lines on the front of the machine. We then know that the machine is set and is in parallel. One thing that we need to point out is to never set the height of the rollers or adjust the rollers without the chosen substrate being between the rollers. We'll next show you how to coat the board with adhesive. Using a product called double sided MagnaFilm, we need to cut ourselves a piece that is slightly larger than the substrate off the roll. So, we'll undo the roll, put the substrate you intend to use on top and cut around it round about half an inch or 10 millimetres all the way around. Always make sure once you cut the substrate, cut the adhesive off the roll is that you tape the roll back down. Offer the board. The first area of adhesive that we've tacked down to the board to the rollers so that it's parallel and catch that first inch or 25 millimetres into the rollers. The material will then go over the top of the rollers and be kept taut along the roller. Using the tack rag, we are just going to go over the board; wipe over the board taking any debris away from the substrate. You then take the release liner and as the rollers are going to drive the board forward, we are going to take the release liner back and away from the rollers so that we've coated up the board with the adhesive. We then need to trim off the excess. We now need to stick the picture down on the coated board. First thing to do is to turn the picture over. Using the tack rag again, make sure that the back of the print is nice and clean. Then, take your knife, starting in one... again, across the shortest edge, starting in one corner, we just dig into the release liner and flick it up. We can then fold back, again, an inch or 25 millimetres of adhesive; again, putting the heavy crease in the release liner. Taking your print; offer it up to the board. We'll start in the one corner; again, smooth out from the centre, making sure that there is not going to be a crease in the release liner. What we have to do now, just in case the excess adhesive may stick to the rollers; we will score through the release liner only, folding back the leading edge, along the two sides so that the only release liner that we are going to take away is directly underneath the print. That again is offered up to the rollers, making sure that it's parallel. Again, grab the first inch, 25 millimetres into the rollers, this time , the print goes over the top of the rollers; again it is kept nice and tight against the top roller. We can then pull the release liner away as it's going through the machine. Transcript: We'll now show you what the dispenser bar on the core docks are for. This is a product called self-winding Mount Film, it's very similar to the double-sided Mount Film that we've been using. It is a double-sided adhesive but it has a release paper on one side only. That release liner is coated both sides with silicon so it actually wraps around on itself almost like a roll of cellophane. This is why we have to use it on the bar. We'll now show you what the dispenser bar on the core docks are for. This is a product called self-winding Mount Film, it's very similar to the double-sided Mount Film that we've been using. It is a double-sided adhesive but it has a release paper on one side only. That release liner is coated both sides with silicon so it actually wraps around on itself almost like a roll of cellophane. This is why we have to use it on the bar. So, what we'll do is we'll put the bar in from one end with the core knob on one end and you'll notice that the material; that the cores have to be in a certain direction with the film and that's how they need to be sitting on the bar. So, we'll pop this next one onto the bar, push it in and we can then put the roller material onto the machine. Okay. The material will then pull forward over the front of the machine and the idea here is that we are going to coat up these boards with adhesive, but off the rollers, larger... it's a higher volume work. We are going to use a scrap piece of board the same thickness as the boards that we are looking to coat up, which is right about the same sort of width as the material and approximately three or four inches or about 10 centimetres wide. We'll just put that onto the adhesive; push it into the rollers, so that it's set up. We now need to close the rollers down until we get to out biting point again and we'll go approximately another half a turn. We can then feed the material in and the idea here is that just take your next piece of board, again making sure that it's mostly cleaned down. We can introduce that to the rollers and we can send that through and then get our next piece of board coated up and we can then just continuously feed that through in to the rollers. Once you've processed your last board, take your leader board that you used to start up the work, behind the last piece of board, just so that you can send the material through the rollers and trim the last board off of the back. We've already got here some of the pre-coated boards. All we need to do now is just to trim off the excess and they are ready for use when you need them. 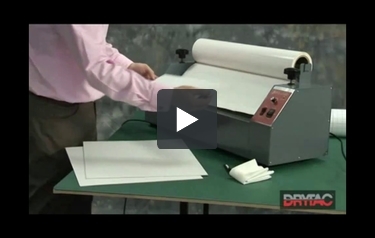 Cold lamination is a terrific way to strengthen your documents while also protecting them. You can even create visual aids for a variety of uses. One cold laminator to check out is Drytac's JM26. Let's take a look at its strengths and weaknesses. The JM26 has a pretty good laminating width of 26.25 inches. The device is large enough to handle a variety of paper sizes (i.e. letter, legal, tabloid) so you'll be able to process both large and small items. This laminator's rollers can have a maximum nip opening of 0.75 inches. This is wide enough to accommodate mounting boards so you'll be able to create professional-looking visual aids for different uses. You can even use foam boards, cardstock, and other thick materials if you want. To ensure all your items look great, this device is equipped with silicone rollers that will evenly apply the film to your items. The JM26 is a cold laminator so you'll never have to waste time waiting for it to warm up. It will also process your items quickly because it's capable of working at speeds topping 18 feet per minute. If you're concerned about safety, you'll like working with the JM26. Since it's a cold laminator, there's very little chance of getting burned. There's also a safety stop that kicks in when the machine detects that your hands are too close to the rollers. That makes this machine great for environments in which safety is a top priority, such as schools. This machine is very easy to use even for people who are new to lamination. The device comes with a foot pedal that speeds up and simplifies operation while allowing your hands to remain free throughout the entire process. The JM26 is compact enough to fit on a desktop despite its generous laminating width. Its dimensions are approximately 33" (width) x 12" (depth) x 12" (height). Finally, this product is well-constructed and has steel parts for durability. It's backed by a year-long warranty. The JM26 is unable to process thermal film because it's a cold laminator. (You'll want to make sure to purchase pressure-sensitive film to use with it.) If you need a machine with a hot setting, this definitely isn't the device to get. This laminator weighs 53 pounds, making it quite heavy. It may be difficult to move on your own, so be sure to ask a colleague for help if you ever need to place it in a new location. Finally, this isn't the flashiest laminator you can buy, unlike some of the devices from Fellowes and GBC. Because of its appearance, it may be better suited for copy and print shops, as opposed to offices. The Drytac JM26 is a very good cold laminator. It's great that it's compatible with a variety of materials because it will enable you to process different kinds of items, such as thermally sensitive documents. Just be sure to use the right type of film with it and get a friend to help you move it. If that sounds good to you, check out the JM26 now. How thick a board can I use in this machine; will it work with harbored like masonite? Thank you for your question. The JetMounter JM26 Electric 26 Inch Pressure Sensitive Cold Mount Laminator can work with boards that are up to 0.75 inches (19mm) thick. It would work with any board that would be receptive to a adhesive based cold laminate. It is primarily designed to work products presentation boards and paper products.